Home >> Lock Pick Sets >> Mini Wedges 2 pcs. 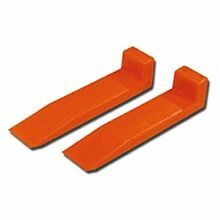 The Mini Wedge Duo is a pair of door wedges (made by prolock) made of soft, high impact plastic made with "self starting" tapered edges. Excellent for wedging in tight places without damage to glass or surrounding material. 4.5 inches long with a unique tab on the end to allow you to easily pull it out even with gloves on.